Barbecue parties are one of the most common forms of social gathering, and it’s the most uncomplicated form as well. You don’t need to prepare much when trying to host a barbecue party, you only need to get the grill ready for grilling, the food that you wish to cook—and it is best to prepare a wide range of food choices that includes pork, beef, chicken, seafood, and even some vegetables. Then of course, you will need to send out event invitations to make people aware that you are actually holding a party. How would able to gain attendees if you won’t send out invitations? Yes, you could just do it verbally or through the phone, but that may be an informal way of gathering attendees to your event. Regardless of how casual an event is, there should always be a formal way of inviting people, which can only be done through invitations. 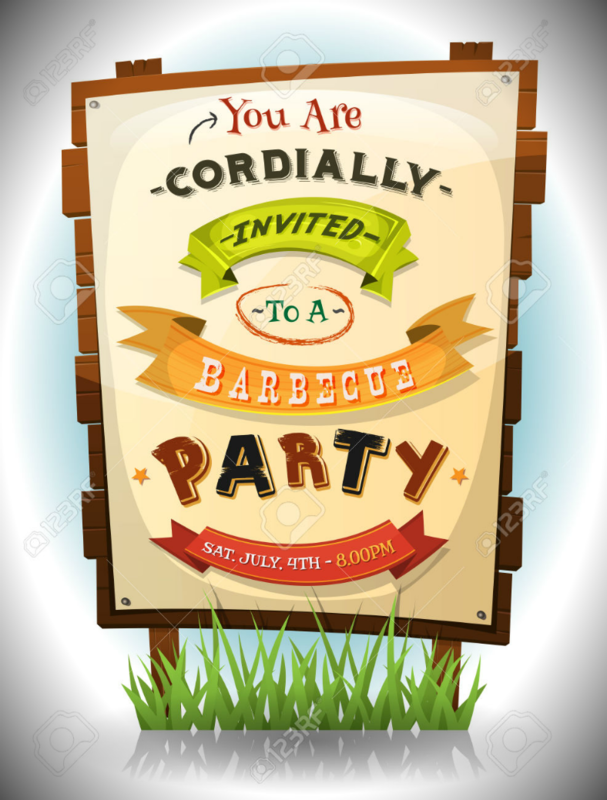 On this website, we have a collection of barbecue party invitations that you can download and use for your own event. If you want to check the designs out yourself, feel free to scroll down. You don’t need to rent a fancy place for the event since you can hold it at the convenience of your own home. This way, you won’t have to spend a lot for the venue and you can focus all your expenses on the food. 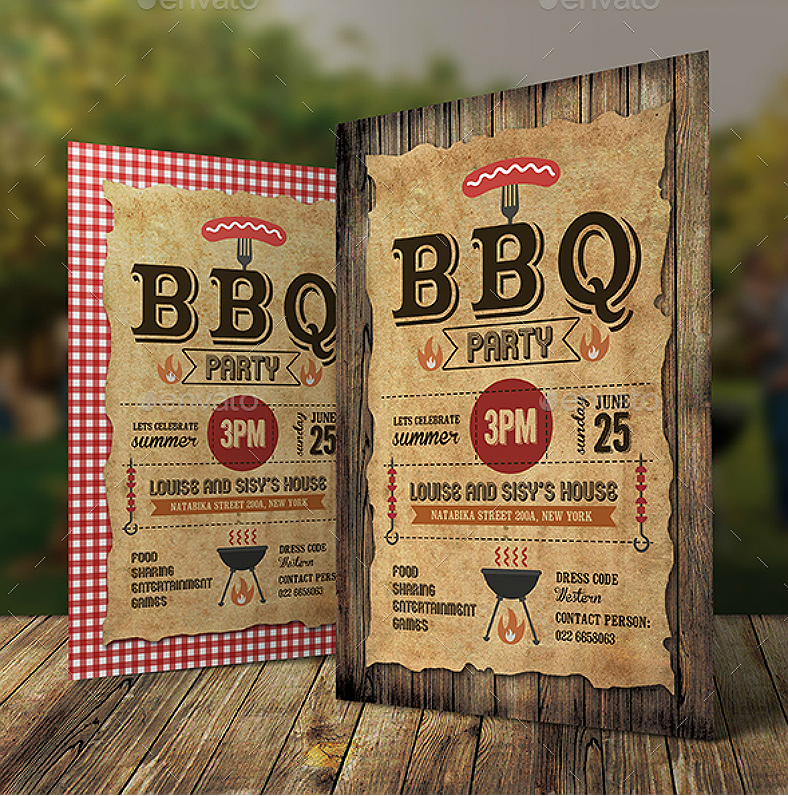 Take a look at the barbecue party invitation design above, it shows us a wooden and rustic theme which is appropriate for outdoor barbecue parties. The backdrop of this rustic invitation design are photorealistic planks of wood that are arranged vertically, and the layer over that is a rustic sheet of paper with uneven edges. On this layer is where you can find all the important information about the party, such as the date and time, the venue, the dress code, and the contact details. If you don’t like the wooden plank background, there is an alternate design you can go with, which replaces the wooden plank with a red and white plaid pattern similar to those used as table cloths during camping. 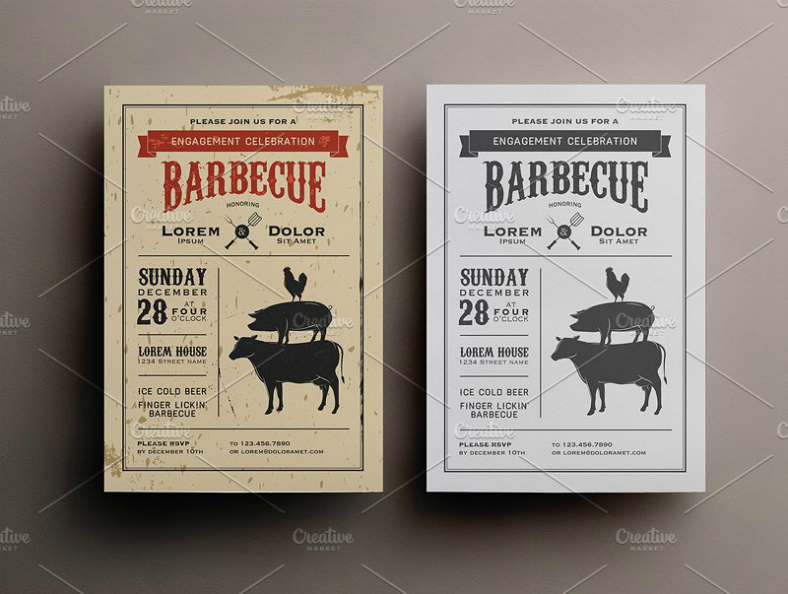 If you planning on hosting an event, whether it is a formal or casual, and regardless of what it is for, this vintage BBQ event invitation design can be useful to you. This design is inspired by those media and advertising tools that were used during the late 1800’s to the early 1900’s. The left-hand side of the design is where you can find the information about the event, and on the bottom portion is the RSVP date and the contact details of the inviting person. For the right half of the design, you can stick to the existing image of a cow, pig, and chicken being stacked, or you can also change it with something else depending on your preference. This engagement invitation can be edited easily, so don’t hesitate to add your personal touches on the design. 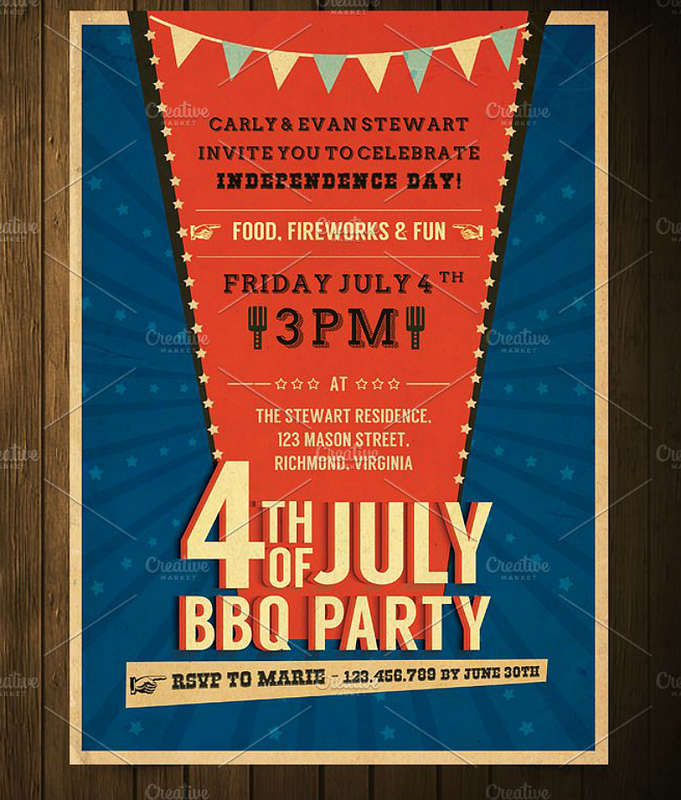 Here’s another good example of a barbecue party invitation that can be used for multiple purposes. 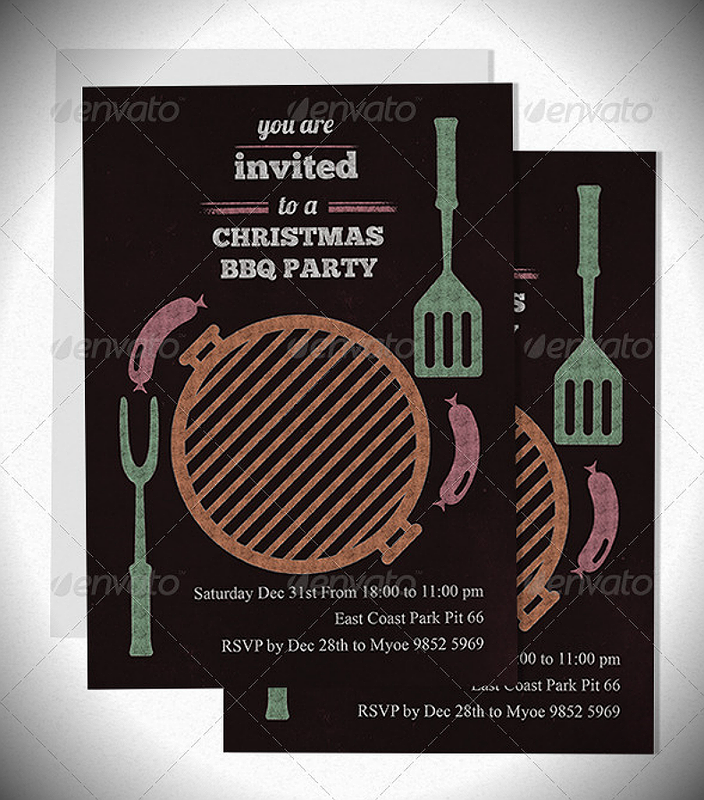 On the sample shown above, the invitation design is used to invite people to a barbecue party which will be held during the Christmas season, but you may still use this for other occasions as well. This flat Christmas party invitation is inspired by chalkboard designs, and leans more toward minimalism by using only a few colors and using a lot of blank space to avoid from appearing cluttered. Just take note, that the details of the event is placed on the right-bottom corner of the design, so make sure not to place a distraction around that area to let the reader find those details easily. 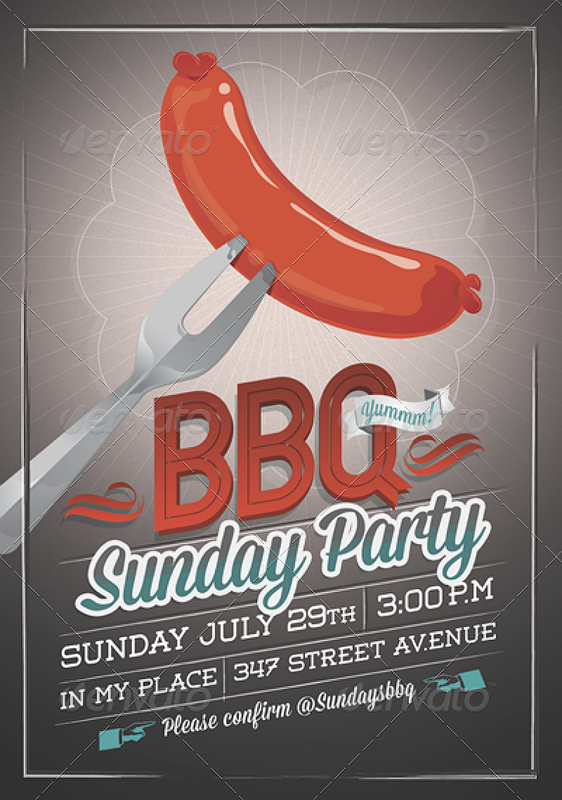 If you want a no-brainer invitation for your barbecue party, then this invitation design may be perfect for you. 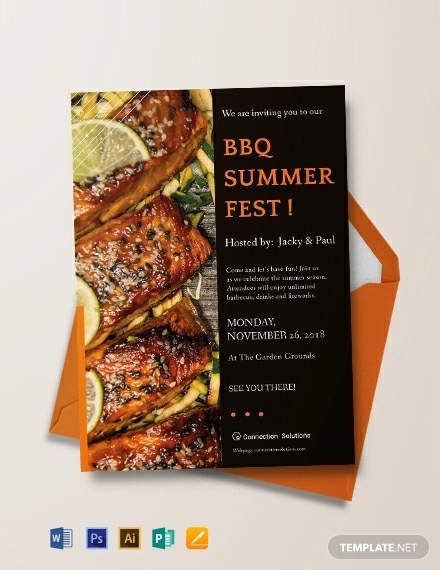 The invitation design above shows us some flat images of a classic charcoal grill with a grilling fork and a cooking paddle across it. But the main attraction of the design isn’t the grill or the kitchenware, but the large typography found on top and below those images. 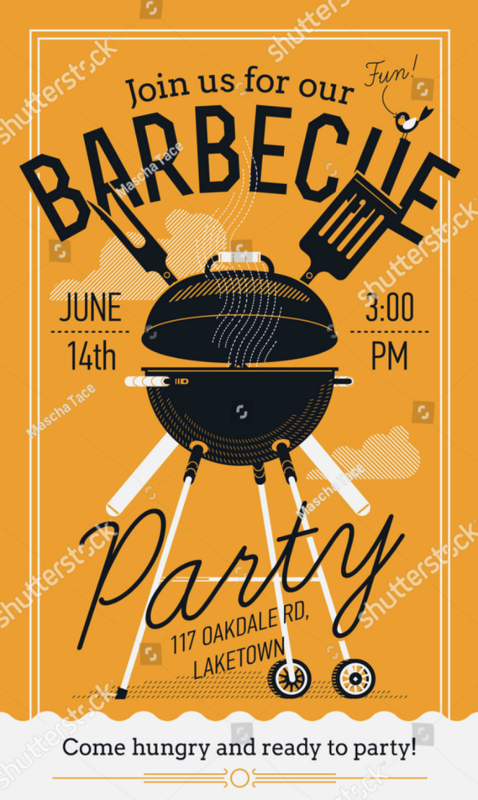 Upon seeing this design, you will easily get the message that this is an invitation for a barbecue party just by those texts. If that’s not simple enough for you, the background of the design is a solid yellow background with cloud vector illustrations which effectively compliments the foreground images and text that are are mostly in black. If you choose not to use this design as an invitation card, you may also use it as a party invitation flyer. Barbecue parties are great during summer because it is the season when people go out to to enjoy the sun and nature in general. The foreground simply shows us an image of a hotdog on a fork. This is just one of those foods that are cooked during barbecue parties. It can also be said that it is one of those that you can bring around easily since it doesn’t get spoiled that quick. Below the image of the hotdog are the information about the party which are written in a way that it gets noticed easily. The colors used for writing these text are in contrast to the one used for the background, which can be changed to two other possible colors. The background of the sample above is in gray, but you may replace this with either pink or blue, it’s your choice. So if you’re planning to host a summer barbecue party, we recommend you download this design. The Fourth of July is one of the occasions which really calls for a big, and we do mean BIG celebration. It is during Independence Day that a lot of events are held nationwide and that people all over the country are united to commemorate the declaration of their independence from the Kingdom of Great Britain back in 1776. There is nothing more eye-catching than a retro-inspired design, which is reminiscent to the advertising tools being used back in the old days. This one looks genuinely retro with the slightly washed out colors, the retro-style typography, and the entire design in general. On the sample design above, it shows us a blue patterned background with a red strip in the middle where all the information about the event are written. On the bottom part of the invitation card design is where you can find the title of the event, the RSVP deadline, the person who you should respond to, and their contact number. Go with this formal invitation design if you prefer hand-drawn inspired images or illustrations, which is exactly how this design looks like. The charcoal grill and the flames appear almost real but are actually done by hand, which is one feature that makes this design visually appealing. Download this design for a neat and artistic invitation that you can use for your event. Chalkboard designs are probably one of the simplest themes you can find in the world of designs. Why? The background is in solid black, and the prints, text, and all graphic images are in white, as if it was done using a chalk. People, especially children, who were born during the modern times have a less likely chance of experiencing being taught using blackboards. So why not let them experience it now on these designs? And for those who have actually encountered the use of blackboards in the past, then this design would serve as something to remind them of the good ol’ days. 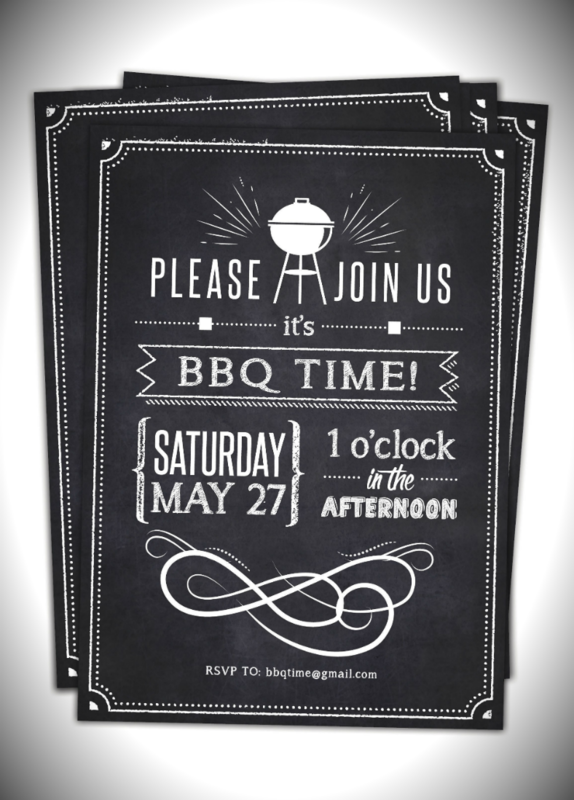 On this chalkboard invitation design, the background is in black, and contains a decorative border around the sides, an illustration of a charcoal grill, some text, and an ornate design on the bottom portion which are all in white. To make this design seem more authentic than it already is, there are uneven white marks that look similar to those that are left behind when you erase writings on a chalkboard. Yes, this invitation design may look more cartoonish than realistic, but that is actually the entire point of this design. This invitation aims to capture people’s attention through its unrealism. With what seems to be a flat illustration of a charcoal grill that is open, you can find all the text and some flat images of food found in between the grill and its cover. This invitation design can easily be edited, and you can change every element present on it, from the background to the text, and even the illustrations. But there’s one feature on this design that’s sure to help it get the notice it deserves, and it is the white space. With the large area used as white space, it provides emphasis to other features on the design that are more important. If ever you decide to change the color of the background, just make sure to use a color that contrasts to the ones used on the foreground features to prevent from defeating its purpose. 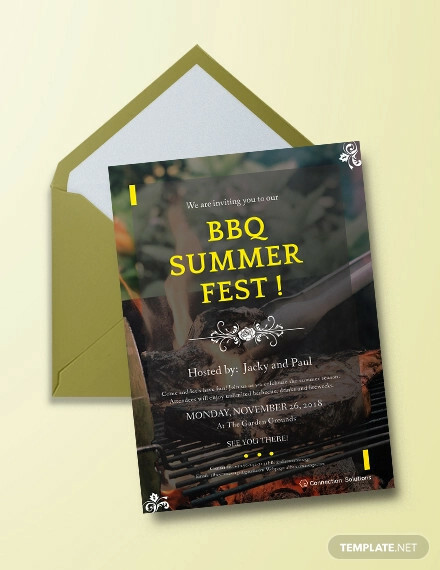 Check out this barbecue invitation design that is inspired by those that you can see on Bugs Bunny television shows or any children’s cartoons. From the sign itself, you can already see that it doesn’t really take itself seriously with the lack of balance in the perspective. While it has been said that when you make an advertising instrument, you should limit the number of typefaces used to a maximum of three per design to avoid from making it look cluttered. As you can see on the design above, there are more than three typefaces which could have made it appear chaotic, but the large white space and the informal theme of the invitation made it look balanced and still appealing. 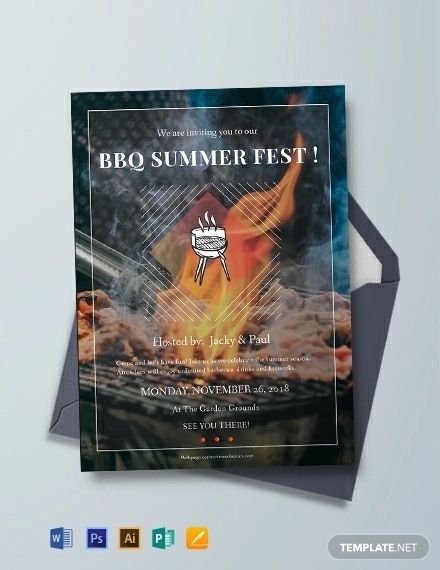 This invitation design is ideal for barbecue events that are simply casual, such as those that will be attended by family members or close friends, or it could be any event that doesn’t require the attendees to be formal. 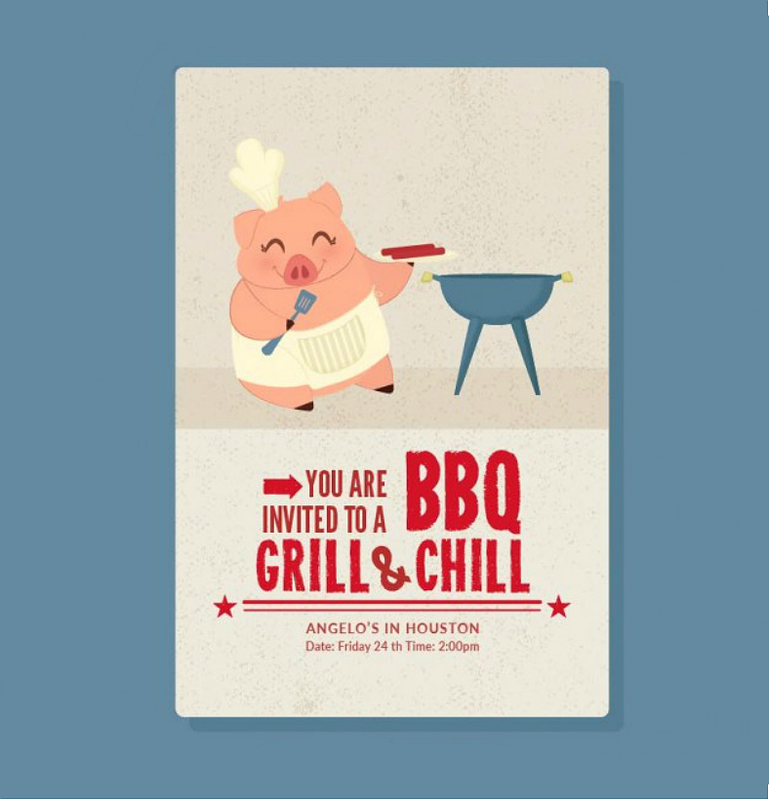 Ask your attendees to join you in your barbecue party with this minimalist invitation design. 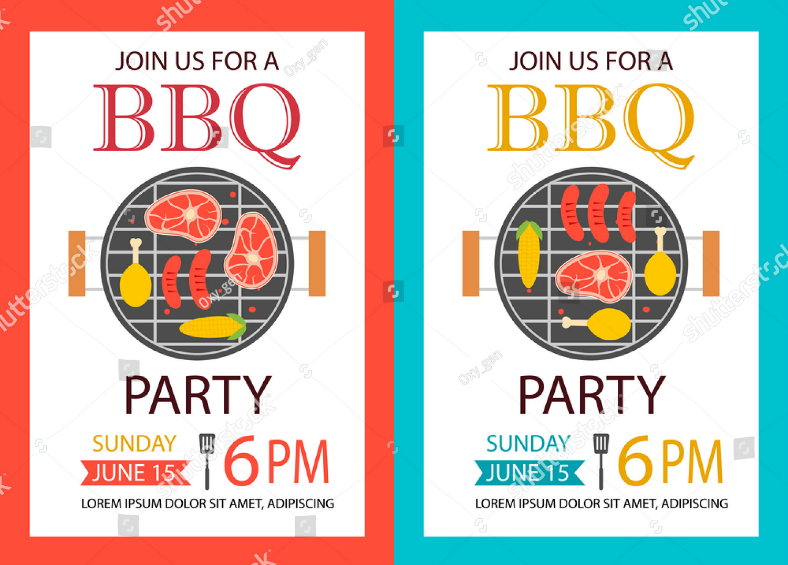 This party invitation contains a thick, colored border around the edges which could either be blue or red, or technically any color you prefer, and the middle area is an overhead image of a grill that is actually cooking some food. If you have noticed between the two designs, the foods that are being grilled on the invitation with red borders are different from the ones with the blue borders. 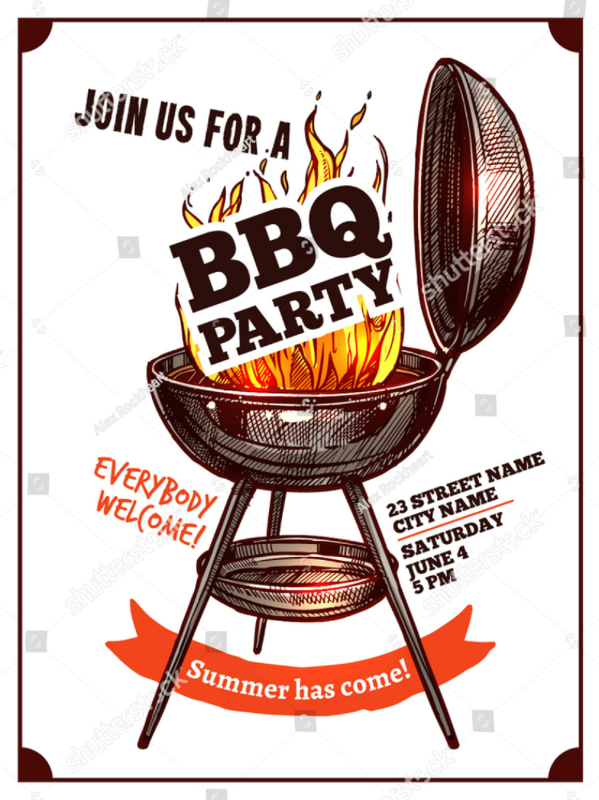 The image of the grill occupies only a small area on the design, and leaves the rest of the space for the text and all the relevant details of the barbecue party. The upper portion of the design is where you can find the phrase that actually expresses the desire of the host to invite the reader to the event. The bottom area, on the other hand, is where the reader can find the necessary details about the event. The invitation flyer design above is once again more on being funny than formal, and this is done by illustrating a chef pig cooking some hotdogs on a grill. As you can see, the pig is enjoying himself as evidence by the smile on his face, and this is what the host of the event wants from their attendees, to enjoy the party that they are hosting. 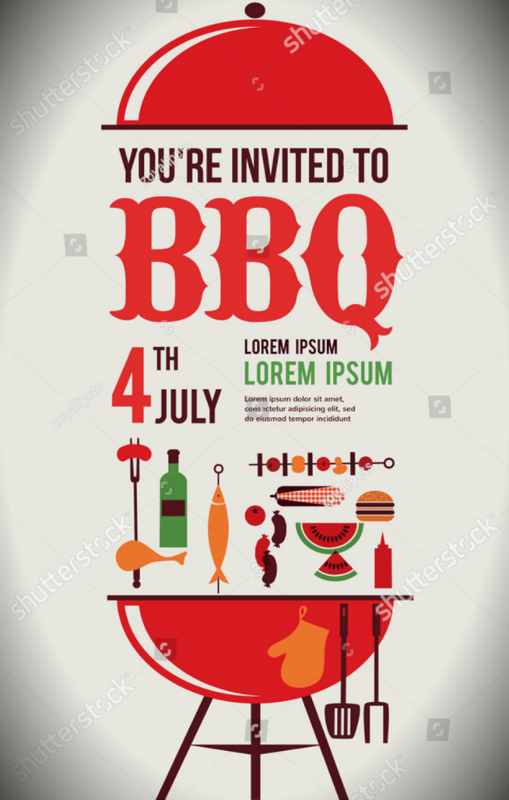 On the bottom half of the design are the text stating that the reader is invited to a barbecue event, the venue where the event will take place, and the date and time that the event will commence. To give emphasis to these text, the background layer underneath it is in a single, contrasting color but is textured to prevent it from looking dull. The number one tip for making your own event invitation is to just keep it simple. Many have that mentality that if you add more elements on the design, it would add to the level of appeal, but is actually the opposite. The more elements are added, the more cluttered the design—the more cluttered a design looks, the less interesting it becomes. Once again, KEEP IT SIMPLE. When supplying the information about the event, be sure to indicate only the most relevant ones and be specific when providing details to avoid confusion on the part of the invitee. To help you with this, keep in mind that your invitation should be able to answer the questions who, what, when, and where. Who is hosting the party or who are the people invited, what the event is all about, when (time and date) the event will take place, and where it will be held. As much as possible, include an RSVP on all your invitations and set a deadline for the response. You will thank us later for this since setting a deadline beforehand will allow you to confirm on the number of attendees and if ever you will need to prepare more than you have expected. Aside from that, having an RSVP will also allow you to limit the number of people that will be attending the event and thus, preventing party-crashers from getting in. Instead of just indicating the street address of the venue, you can also choose to add a small map with some landmarks for places that are unfamiliar to a lot of people. If ever some guests are still unable to locate the venue even with the map, encourage them to call you by indicating your contact number on the invitation. Your invitation can also be used to set the mood for the event, so make sure that it appropriately fits to the theme. When hosting a summer barbecue party, your invitation should have a summer theme as well; for formal barbecue events, your invitation should also have a more formal and less casual appearance. These invitation designs can be downloaded easily as long as you have a stable Internet connection, and these can be yours for a very reasonable price. Simply click on the buy/download button, pay the required fee, and the invitation design can be yours. As for the quality, these designs were made by highly talented graphic artists, which assures you of only the best content. And for the editability, most of these designs, if not all, are in vector format, which are fully and easily editable. They also have the ability to retain its high resolution even when resized. This way, it allows you to edit the design as much as you want without having to worry about ruining the quality. So, if you find these invitation designs useful, then keep your fingers busy and start downloading your own design now.